Africans in Libya are being forced out by NATO-backed terrorists. 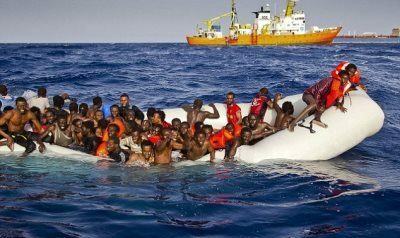 AFRICANGLOBE – One in every 42 migrants who crossed the Central Mediterranean route separating North Africa and Italy has died this year, up from one in every 52 in 2015, the UN Refugee Agency (UNHCR) reported Friday. “This makes 2016 to date the deadliest year on record in the Central Mediterranean,” the agency said in a statement. “The chances of dying on the Libya to Italy route are ten times higher than when crossing from Turkey to Greece,” it added. According to latest International Organisation for Migration (IOM) figures, 278,327 migrants and refugees have reached European shores by sea through the first eight months of 2016. IOM’s fatality count shows that 2,731 migrants have perished on the central Mediterranean passage, compared to 386 on the Eastern Mediterranean route separating Turkey and Greece. A further 54 individuals have drowned on the Western Mediterranean and Western African routes. All these figures are substantially higher than 2015’s death toll over the same period.